North Coast Labs' staff consists of approximately 30 employees. Staff positions include the following: Laboratory Director, Director of Operations, Laboratory Manager, Quality Assurance Officer, Sample Custodian, Organic Laboratory Supervisor, Inorganic Laboratory Supervisor, and numerous technical positions. These individuals are qualified and adequately trained in their respective duties. Mr. Chaney received an M.S. from Humboldt State University in Plant Physiology, a B.A. in Biology, Zoology, and Botany and an A.S. in Civil Engineering Technology from Monterey Peninsula Junior College. After receiving his M.S., he was selected as director of the Pacific Southwest Forest and Range Research Station's Redwood Sciences Laboratory in Arcata. He was responsible for all aspects of beginning operations and supervised the laboratory for five years. In September 1979, Mr. Chaney left the USFS Research Station to take the position as Director of North Coast Labs. During his tenure NCL has grown from a small, one-room facility to a full service commercial laboratory. 1) all technical operations, 2) quality assurance, 3) the promotion of employees, 4) financial stability 5) capital investments. Method development chemists are directly supervised by Mr. Chaney who acts as the lead method development chemist in the FIFRA Studies Division. In addition to extensive bench chemistry experience, Mr. Chaney has attended numerous classes on operation, maintenance, and data interpretation for AA, ICP, GC, HPLC, GCMS and LCMSMS. His professional affiliations include the American Chemical Society and the Association of Official Analytical Chemists. Ms. Golich-Moore received a B.S. in Chemistry from Humboldt State University in Arcata, CA and has been employed at North Coast Laboratories since 1987. She has experience both as a bench chemist and operator of GC and HPLC instruments. Ms. Golich-Moore was promoted to supervisor of the organic laboratory in 1988. In this capacity she oversaw and reviewed laboratory operations. She was responsible for ensuring data quality and timeliness. In 1997 Ms. Golich-Moore was promoted to laboratory manager for both environmental and registration study operations. In this position she was responsible for overseeing and coordinating all aspects of the laboratory including analytical operations, client services, quality assurance and safety and health. In 2008 Ms. Golich-Moore was promoted to Director of Operations where she continues to oversee all aspects of the laboratory operations and assists the director in making financial and business development decisions. Mr. Jordan received a B.S. in Chemistry from the University of Southern California and has been employed at North Coast Labs since 2009. During his career he has had roles as a bench chemist and supervisor in general and organic chemistry departments. He is knowledgeable in instrumentation including GC, GCMS, and HPLC. As Lab Manager, Mr. Jordan is responsible for the day-to-day operations and management of the laboratory; in addition, providing oversight and support for the quality assurance/quality control programs. With the Laboratory Director he provides the technical, operational and administrative leadership through the planning, allocation and management of personnel and equipment resources. Mr. Fuhrmann received a B.S. in Chemistry from Humboldt State University and is currently completing his MBA in strategic sustainability at the same institution. His previous experience includes a biochemical research group where he studied cyanobacteria. Byran is a member of the American Chemical Society and also a proud Eagle Scout. 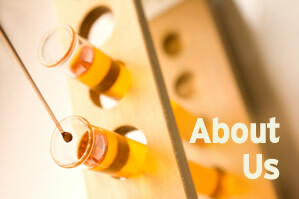 He is familiar with GC, GCMS, HPLC as well as bacteriology testing and is certified in Good Laboratory Practices (GLP). Mr. Fuhrmann is responsible for all aspects of the quality assurance program at North Coast Laboratories for the both the environmental and GLP portions of the laboratory. He implements and monitors the program, ensures compliance with regulatory requirements, trains employees in quality assurance procedures and ensures North Coast Laboratories follows methods and SOPs as documented. Ms. Noon has been employed at NCL since 1981. She received her B.A. in Sociology from Dickinson College and her M.S. degree in Molecular Biology from the University of New York at Albany. She has seven years of direct laboratory experience, which include research positions at the New York State Health Department and the Department of Biology at the University of New York at Albany and analytical chemist position at NCL. Ms. Noon became the manager of NCL in 1985 and held this position until January 1998. During this time, she oversaw the development of the laboratory into a full service environmental laboratory which includes the FIFRA registration division. She was responsible for the development and implementation of the GLP program beginning in 1987. Ms. Noon has attended numerous outside technical training classes and has presented papers at a number of national meetings, including those of the Society of Quality Assurance, the American Chemical Society and ACIL-IAETL. Presently, Ms. Noon consults with the current management at NCL regarding operations and business development. She also provides quality reviews of the laboratory and reporting data. In addition, she works as a Study Director or PSI on a variety of projects which involve agricultural chemical registrations. Mr. Stuart received a B.A. in Earth Science from the University of California at Santa Cruz. He began his employment at NCL in 1990. Since this time Mr. Stuart has gained expertise in performing inorganic analyses in the wet chemistry, metals and bacteriology departments. He has been responsible for the analysis of all metals using either an ICP, graphite furnace or flame atomic absorption spectrophotometer. Mr. Stuart was promoted to inorganic laboratory supervisor in 1997. Mr. Stuart is responsible for directing inorganic laboratory operations and ensuring data quality and timeliness. This involves scheduling the analysis of samples, reviewing data, and solving technical problems. Mr. Stuart operates instruments and performs sample analyses when required. Mr. Thompson received a B.A. in Botany from Humboldt State University, Arcata, CA and has three years of graduate studies in biology emphasizing chemosystematics of fungi. He has attended a Varian course on the Fundamentals of Liquid Chromatography, and an ACS class on Practical HPLC Method Development. He has attended the Pesticide Residue Workshop sponsored by the California Department of Food and Agriculture and made a technical presentation at the workshop in 1990. Mr. Thompson has developed numerous methods using HPLC technology. Mr. Thompson's duties include analytical method development and troubleshooting related to the extraction and analysis of trace organic compounds. He is also responsible for the operation, maintenance, and repair of all HPLC equipment.